The text is partially lifted from a line in The Eagles’ song ‘Take it Easy’; ‘It’s a girl my Lord, in a flat bed Ford’. Fascinated by the wordsmith skills of lyricists Jackson Browne and Glenn Frey and how they got GIRL, LORD and FORD in one line in a song I wanted to see if there was another way to connect them using the brain teaser game of creating a new word by altering a letter in an existing word. 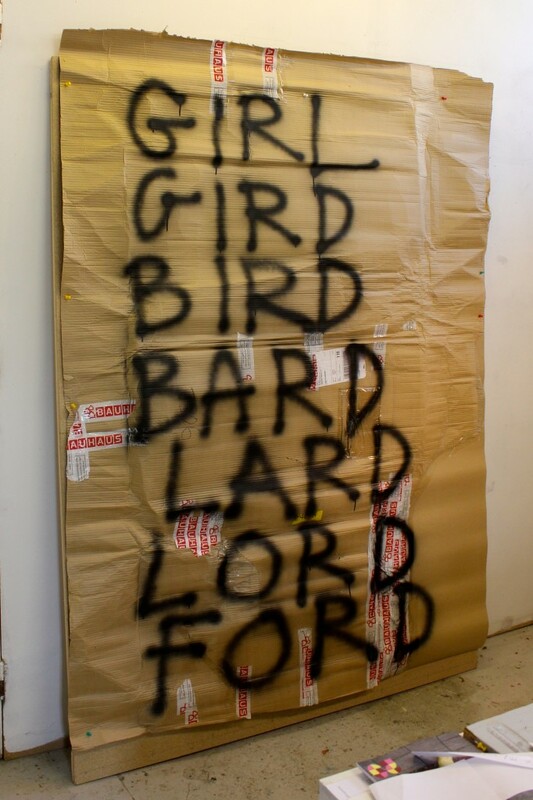 And from that I got the following; GIRL – GIRD – BIRD – BARD – LARD- LORD – FORD. The simple packing paper background and swift execution of the text in spray paint exaggerates the objectness of the words and the quickfire links between them.